I finished off my ancient oatmeal today with a nice handful of blueberries on top. Then I went out and bought another box!–This is a very tasty hot cereal. I must admit that by now I was suffering from a slight case of food fatigue. For lunch, I had a simple bowl of leftover bean and vegetable soup. No bread, no fruit, no cheese. Just right. My friend Mary and I were booked to take in a movie this afternoon, so I invited her over here afterwards for halibut tacos. Growing up in Texas, I ate more than my share of the classic Tex-Mex taco: crisp corn taco shell, seasoned ground beef, lettuce tomato onion, jalapeno slices, and grated yellow cheese on top. I still love it. 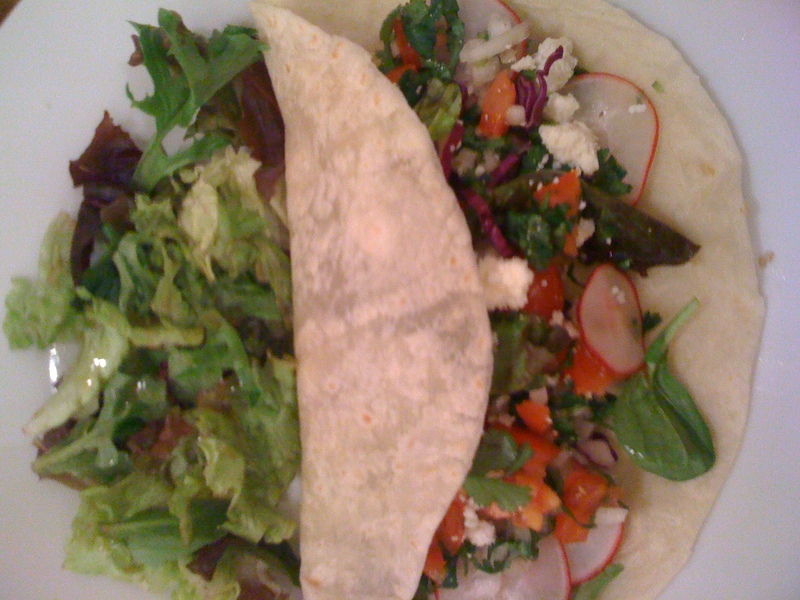 This entry was posted in Meal planning and tagged cooking fish, cooking Mexican food, fish taco, home cooking by judyramey. Bookmark the permalink.